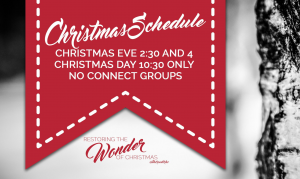 There will be 2 services on Christmas Eve (2:30 and 4pm), and one on Christmas Day (10:30 am). These three services will be identical so if you’re considering your plans for the weekend – you should only choose one service! There will be no connect groups during these services. Enjoy the days with your family!